Statistics say that room painting is the most common of all home DIY projects, yet it is the one that is most often messed up. "Messing up" is, in this case, a literal description, because the biggest problem with room painting is getting good results without the paint going every which way—splattering, dripping, sagging, staining and otherwise frustrating you. It is possible, though, to paint with no mess at all, if you are patient and follow these tips. Clean out the room as much as possible. The fewer pieces of furniture and accessories you have in the room, the fewer obstacles here will be to mess-free painting. Remove electrical cover plates on switches and outlets. You can reinsert the cover screws into the metal straps on the switches and outlets to avoid losing them. Set the cover plates aside in a safe location. This can also be a good time to replace those cover plates with more stylish ones. Remove window hardware (if they are to be painted), such as sash locks and handles. Store them safely. Also, remove any cabinet hardware if you are painting cabinets. 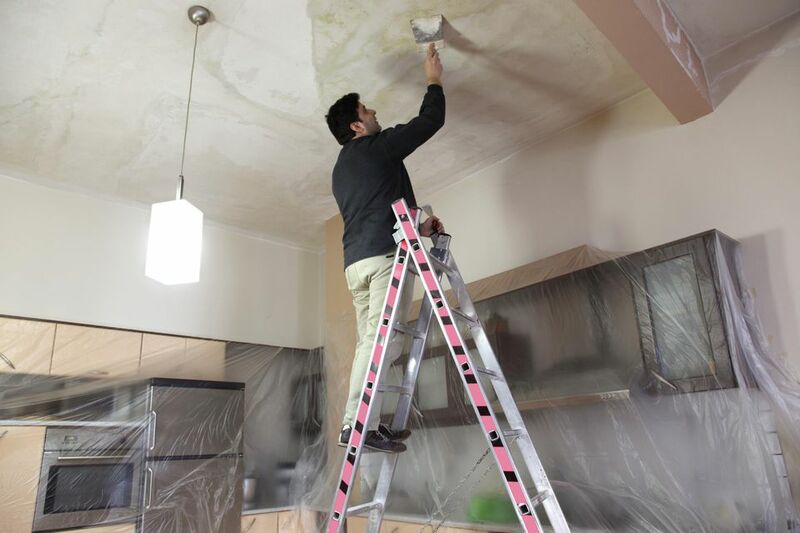 Protect wall and ceiling lighting fixtures with tape or plastic, or better yet, remove them. Remove the doorknob and the latch strike plate, if you are painting the door. Tape off the lock. Protect furniture from paint and roller splatter with plastic drop cloths. Protect the floor with a drop cloth or sheets of plastic. One excellent type of drop cloth has a plastic face bonded to a cloth layer that absorbs drips. If there is sanding to be done, finish any sanding then carefully clean away all residual dust. Thoroughly clean and dry all surfaces to be painted. Make sure you have good lighting in the room. Buy or rent some floodlights, if needed. Being able to see well is critical to avoiding a mess while painting. A note about painter's tape: Some people insist that masking off woodwork and baseboards with special painter's tape is a critical part of preparation. Others find tape to be more trouble than it is worth. The truth is that painter's tape can be helpful if you simply aren't able to control a brush carefully, but it might be unnecessary if you are skilled and careful when handling a brush and roller. Second, the room's surfaces should be painted in a particular order for best results. As professional painters know, the best procedure is to start from the top of the room and work your way down and to save the fine detail work for the end. If you are going to apply primer, coat the ceiling first, then the walls and trim. Paint the ceiling with the finish paint. Paint the wall surfaces. If you are painting walls with a paint roller for the large areas and a brush around the edges, as most people do, apply the roller paint first, then finish up by "cutting in" around woodwork and along ceilings and baseboards. Paint window and door trim, and any other woodwork in the room. Paint cabinets, if they are part of the plan. Paint the windows and doors themselves, if that's part of the plan. If possible, it is best to remove windows and doors from their frames or hinges and lay them flat on sawhorses to paint them. Painting is such a common DIY project that few people realize that there is an actual technique that leads to better results. Here are some tips for using brushes and rollers with a minimum of mess. Use a roller cover with the proper nap length. A roller with more nap than you need will often spray paint around as you roll—long-nap roller covers are designed for covering textured surfaces; for flat walls, use short-nap roller covers. Use roller covers that are the right material for the paint you're using. Don't try to get by "on the cheap," because cheap roller covers often leave lint behind in your fresh paint. For latex paints, good-quality roller covers with synthetic fabrics (nylon, dacron, or polyester) are economical and effective. For oil-based (alkyd) paints, use roller covers with natural fabric—mohair or sheepskin. Blended covers that use both wool and polyester offer perhaps the best performance for all paints. They cost more but are an excellent choice for mess-free painting. Mask off woodwork if you fear paint spatter from the roller. Although rolling with controlled, slow strokes usually eliminates spatter problems, you may want to use tape and/or paper to cover woodwork if you're unsure of your technique, or if you're not planning to paint the woodwork. Roll with slow strokes, beginning with a "W" pattern to apply paint to the wall, then spreading it across with horizontal strikes, then finishing with vertical strokes. Slow strokes of the roller will prevent paint from spraying. Work in areas about 4 x 4 feet in size, covering the area thoroughly before moving to the next. Begin across the top of the room walls, then finish along the bottom. Use brushes with the proper type of bristles. Natural-bristle brushes—which usually use pig or horse-hair bristles—should be used only for alkyd- based (oil) paints. For water-based latex paints, use synthetic-bristle brushes. Brushes that blend several different types of synthetic bristles are best for latex paints. Buy quality paint brushes. Efforts to save money by buying cheap brushes aren't the path to mess-free painting. Cheap brushes may shed bristles into your fresh paint job, and they are more susceptible to drips because the bristles are less absorbent. Use brushes that are the proper size. A common mistake is to use brushes that are too large in an effort to paint quickly. Smaller brushes will give you better control and reduce fatigue—and mess. Use brushes with angled tips (called "sash" brushes) for fine detailed work along woodwork. Flat brushes are best for painting large wall areas, but are messy when used for fine detail work. Load the brush with paint so that it only covers the bottom one-third of the bristles. Too much paint on the brush will cause messy dripping. Reloading the brush frequently with small amounts of paint will greatly reduce mess. Hold the brush as you would a pencil, not a hammer. This gives you much better control of the brush as you "cut in" around woodwork and ceiling lines. When cutting in, draw the brush along the edge, not "on the flat." Move the brush as though you were drawing a line with a pencil, not gripping it like a garden tool.